Favorite way to use your Tstand? Lying down in bed with your iPad, no doubt. But what about the tablet’s biggest competitor? We bet you often find yourselves reading lengthy blog posts or watching videos on your Facebook newsfeed from your smartphone. In fact, with the Samsung Galaxy and iPhone’s increasingly large screens and high resolution displays, it is easier to watch movies or TV shows on the go. Luckily, Tstand thought of everything. We created an add-on that transforms your stand into a smartphone or iPhone holder for car or bed. By purchasing the Pro Version add-on pack from our online store, you’ll be able to maximize Tstand’s benefits. Travelling with an iPad can often feel risky. What if my luggage gets lots? Our car gets broken into? If someone steals my iPad out of my bag? There are definitely risks when travelling with a tablet. It is lighter and more compact than a regular laptop. This versatility is great for travelers and thieves alike. That being said, you might not want to take your tablet with you for other reasons. Maybe you want to make sure that you won’t be tempted to work while on vacation with your family. Or maybe that new iPad cost way too much to have the six year old accidentally drop it into the Pacific Ocean. Either way, sometimes you want to leave your tablet at home. But we are prepared to put good money on the fact that you won’t leave your smartphone behind. For most Millennials going phone-less is the equivalent of free-floating in deep space. Tstand’s smartphone adapter makes an awesome iPhone holder for car, train, bus or plane. Everyone loves watching movies during a long trip. Snap the smartphone adapter onto your Tstand, insert your phone into its silicone grippers, and position the angle to suit your needs. If Tstand is positioned in your lap, rotate the Tstand into Desktop Mode to keep it balanced and sturdy. Sharing your screen just got easier. With the smartphone adapter, you can share your phone’s screen with your co-traveler much easier. Tstand’s iPhone holder for car is perfect for those long road trips. 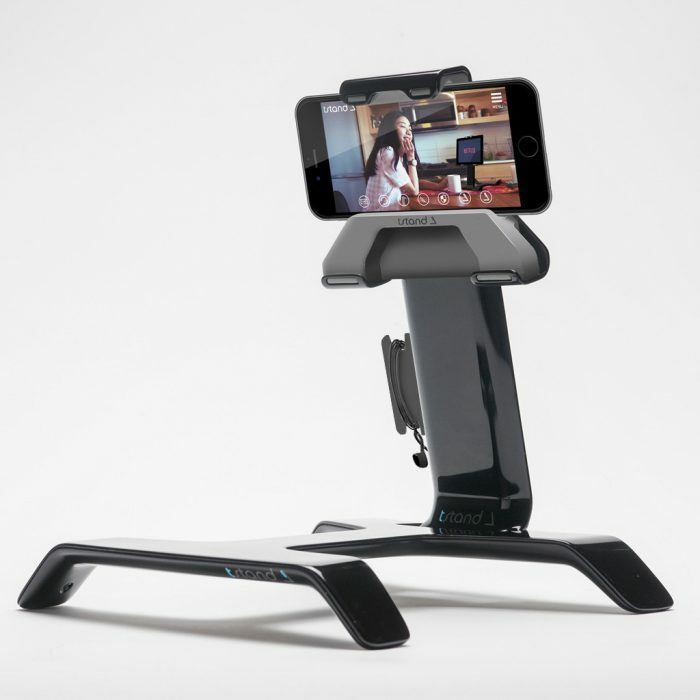 Snap in your smartphone and balance Tstand between the kids in the backseat! They won’t have to take turns holding the phone, and you won’t struggle to find a safe place to prop it up in a moving vehicle.